The first major event on the 2014 Côte d’Azur sporting calendar, the Prom’Classic, is a great way to burn off those extra Christmas pounds! Time to start thinking about your New Year’s resolutions already — sorry! 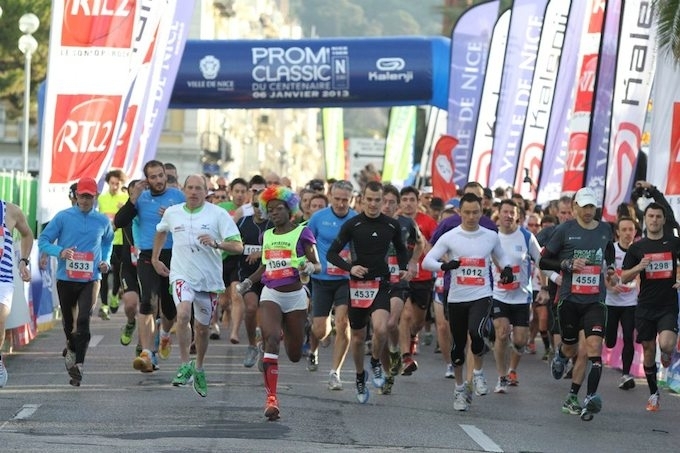 The annual Prom’Classic 10km road race is back in Nice on Sunday, 5th January, 2014, giving us all the perfect opportunity to face into the new year with the best of fitness intentions. The race, now in its 15th year, is traditionally very well supported, with in excess of 7,000 participants last year. Entries are now being accepted for the 2014 race, both online and by post. If you register by the end of November 2013, the registration cost is €14, which increases to €19 for entries received by the end of December, and €25 in the days before the race. Once again this year, the organisers are offering a special deal for those who wish to enter both the Prom’Classic and the Rock’n’Roll 10 Mile event to be held during Carnaval 2014. All submissions must be accompanied by an approved medical certificate. As an added benefit to those who may be new to the sport, why not consider attending some of the training sessions on offer? These are run courtesy of some of the more passionate runners, who will be available to dispense strategic advice and encouragement to all. These sessions will be held at 10am on 30th November, 7th and 14th of December (Saturdays), starting from just in front of the Théâtre de la Verdure on the Promenade des Anglais. There will also be a final training session at 10am on Saturday, 4th January, followed by a complimentary breakfast for all participants. The starting point is once again the Théâtre de la Verdure, where you will also be able to beneift from a collective pre-race warm-up from 9:30 – 9:45am on the day of the race. The organisers will also have a Running Expo Village in place from the 3rd to the 5th January, open to participants and the public alike. Runners will be able to pick up their race numbers here from 1pm on Friday, 3rd January, and also discover for themselves what is new in the world of running apparel and equipment. The village is open from 1-7pm on Friday 3rd, and from 9am until 7pm on Saturday 4th January. It will also be open on the day of the race from 8am to 9:15am but only for international runners to pick up their numbers. Whether you’re a sub 30 minute runner, or you’re just looking for a nice way to spend a Sunday morning on one of the most stunning courses in the world, this race is for you. So, start off the new year on the right foot, set yourself new challenges, and sign up for the 2014 Prom’Classic now!